The 2016 Gold Coast champion is Kaile Su 6d followed very closely by Subin Kim 6d, the Gold Coast Kyu Champion is Ian Cook 10k. The 2016 Brisbane champion is Yu Zekun 5d of Canberra, the Brisbane Kyu Champion is Sun Woo Nam 4k. The 2016 Australian Digital Champion is Kevin Liu 6d of New Zealand, the Australian Digital Handicap Champion is Sebastian Zhang 2d. Yu Zekun 5d is the new Australian Capital Territorial Champion. Jungchang Hwang 5d is the new 2016 New South Wales champion, Robin Garner 3d won division B and Francois Beaussier 2k division C. Next is the 2016 Australian Digital from Sunday 26 June, the Victorian Children's and Australian Capital Territorial Championship in July. The Sydney Autumn tournament was again a great success. Next are the 16th Victoria Championships in Melbourne, May 28 to 29, and the 2016 New South Wales Championships in Sydney, June 18 and 19. The 2016 Australian Congress Champion is Min Gyu Oh 5d of Sydney, with Jun Chan Hwang 4d and Tony Oxenham 1k winning the second and third divisions of the main tournament. Zenling Wang 5d + Lu Pin 4d winning the pair go event. Next is the Queensland Championships in Brisbane, March 19 to 20, 2016. The 2015 Australian Open Champion is Wei Zhou 7d of Sydney, and the 2015 Australian Kyu Champion is Yoko Usami 10k of Brisbane. Next is the Australian Go Congress in Sydney, January 15 to 19, 2016. The 2015 Gold Coast Champion is Kaile Su 6d of Brisbane, with Dongjie Wu 3d and Adrian Xavier 11k winning the second and third divisions. The 2015 Australian Digital Champion is Tom Chen 5d of Sydney, reserve champion Ken Xie 5d of New Zealand. Next is the Nationals on December 5 and 6 in Brisbane. Zhou Wei 7d won the Korean Ambassadors' Cup for 2015, Kiwoong Kwon 2d and Justin Shao 2k winning divisions B and C. Hantao Huang 7d won the 2015 Sydney Spring tournament. The 2015 Australian Digital Champion is Tom Chen 5d of Sydney, reserve champion Ken Xie 5d of New Zealand. Next is the Gold Coast Classic on October 25, and the Nationals on December 5 and 6 in Brisbane. Next is the ACT Championships on Saturday 25 and Sunday 26 July, then the Korean Ambassadors Cup in Sydney on 16 August, and the Australian Digital in September, all of September. Next is the Victoria Open on Saturday 4 and Sunday 5 July. The 2015 Sydney Autumn champion is Zhou Wei 7d; Division B winner is Aaron Chen 1d, Division C the legendary Andrew Fischof 6k. Next is the New South Wales Championships on Saturday 6 and Sunday 7 June. The 2015 Hoju Dona Cup Champion is Zhou Wei 7d, and kyu champion is Gareth White 10k. Next is the Sydney Autumn Tournament, on Sunday 22 March. The 2015 Queensland Champion is, yet again, Kevin Jiang 7d. The 2015 Kyu Champion is Dominic Chan 2k. Next is the 2015 Hoju Donga Cup, on Saturday 7 March. 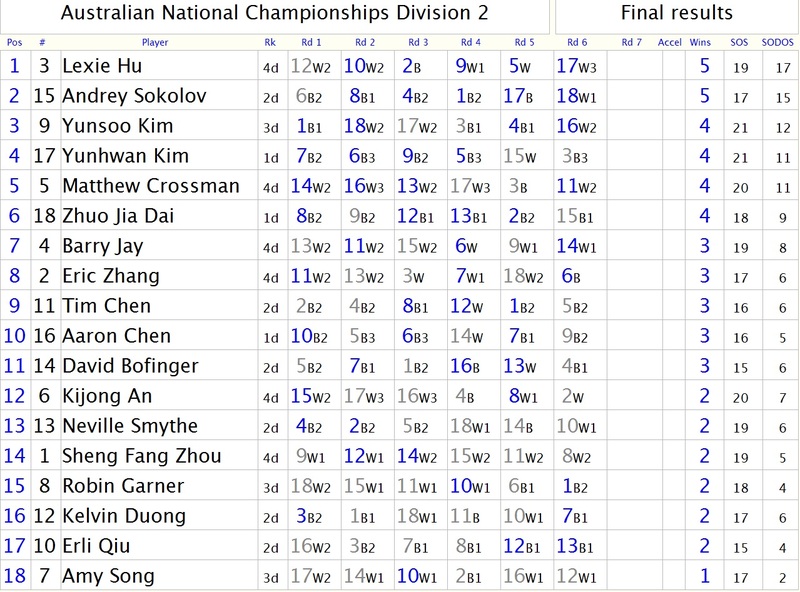 The 2014 Australian Champion is Zhou Wei 7d. Division 2 of the Australian Open was won by Lexie Hu 4d, and Division 3 by Tony Krentz 5k. Next is the Queensland Open on 7 and 8 February. The 2014 Gold Coast Champion is Kevin Jiang 7d. Division B of the Gold Coast Classic was won by Robin Garner 4d, and Division C by Ravi Pache 10k. Next is the Australian Open on 6 and 7 December. The 2014 Sydney Spring Tournament was won by Thomas Debarre in Division A and Aaron Chen in Division B. Next is the Gold Coast Classic on 26 October. The 2014 Korean Ambassadors Cup champions are Wei Zhou 7d (division A), Zenglin Wang 5d (division B) and Florian Max 5k. Next is the Gold Coast Classic on 26 October. The 2014 New South Wales Championships was a great success. Next is the Australian Capital Territory Championships on 26/27 July. The 2014 MCSQ Cup was won by Markus Pache 5d. Next tournament is the Autumn Leaves on Easter weekend. The 2013 Australian Champion was Cai Shuping 7d. Next tournament is the Hoju Dong-A Cup, 1 March. Gold Coast Classic winners were Kevin Jiang 7d, Jinsong Sun 3d and Warrakun Mangrai 5k. The Nationals will be in Melbourne on 7th and 8th December. The Australian Capital Territory Open happened in Canberra, July 28 and 29. Next tournament is the Korean Ambassadors Cup, July 11. The 2013 New South Wales Open in Sydney was won by someone. Next tournament is the Australian Capital Territory Open in Canberra, July 28 and 29. The 2013 Golden Aussie championship was tied between Chimin Oh 7d and Guyu Liu 7d. Next tournament is the New South Wales Open in Sydney. The 2013 Queensland Champion is Kevin Jiang 6d of the Gold Coast. Next tournament is the Capital Go Challenge in Canberra. The 2012 Australian Champion is Chimin Oh 7d of Sydney. Next tournament is the Queensland Open in March. The 2012 Australian National Go Championship is on December 8 and 9 at Hope Island Resort on the Gold Coast. A two-day summer school will be taught by An Younggil just before that weekend. The 2012 Gold Coast Classic champion is Cecil Kuo 7d. Next tournament the Korean Ambassador's Cup (November 11), and the Nationals on the Gold Coast, December 8-9. The 2012 NSW Open champion is Eunkuk Kim 7d. Next tournamen is the ACT Open in July, then the Gold Coast Classic (October 28), the Korean Ambassador's Cup (November 11), and the Nationals on the Gold Coast, December 8-9. The 2012 MCSQ Cup winners were Eugene Lee 6d (open) and Carlos Alperin (second division). Next up is the NSW Open, then the Gold Coast Classic and the Nationals on the Gold Coast, November 24-25. The Queensland open and kyu champions for 2012 are Markus and Yanis Pache. Next tournament is the MCSQ Cup on 28 April, then the Golden Aussie in Victoria and the NSW Open. 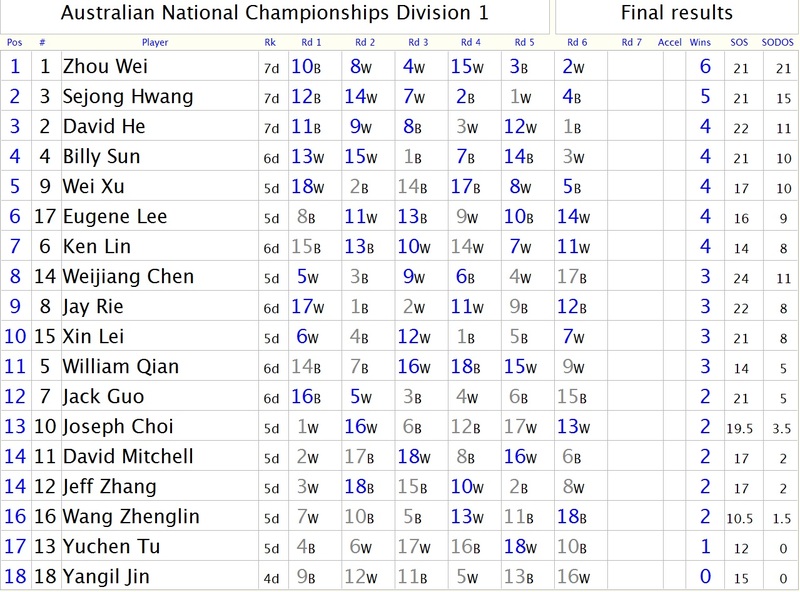 The Australian champion for 2011 is Guyu Liu 7d. The next first-class tournament is the Queensland Open in March 2012. Australian National Go Championships will be held in Canberra for the first time in several years. 2011 New South Wales Championship, Queensland Championship, and Golden Aussie Cup played so far this year. AGA web pages still being updated to reflect the existence of 2011; our apologies. The Young Go Academy opened on Sunday 11 July in Strathfield, Sydney. The next Australian tournament is the Australian Capital Territory Championships on the 24-25 July in Canberra. Shu Ping Cai 7d won the open division of the inaugural Golden Aussie Go Tournament in Melbourne, with Woon Moon Jeong second and Zack Zhou third. Gu Guang Lin and Xu Ran won the second and third divisions. The next Australian tournament is the New South Wales State Championships on the Queen's Birthday weekend in Sydney. The 2010 Queensland champion is Markus Pache 4d. Second place in the thirty-first Queensland Championships went to Akira Tamura 4d, and Qi Wan Qiu 4d placed third. The top two players won five of the six rounds and were separated on the sum of their opponents' scores. Next up is the Golden Aussie Go Tournament in Melbourne (17-18 April), the New South Wales Championship, and then the Nationals at Sydney in October. The 2009 Australian open champion is Zack Zhou 7d. Second place in the open division of the thirty-second Australian National Go Tournament on the weekend went to Kevin Chen 7d, and Raphael Shin 7d placed third. All three players won five of the six rounds, and were separated on the sum of their opponents' scores. Next up is the Brisbane Pair Go Tournament on the nineteenth of December, and then the Queensland Championships in Brisbane on the 6-7 of February. The KAC top section was win by Yiming Guo after a major comeback from losing his first game; the top 3 players all had 4 wins out of 5 and the same SOS, separated by only one point of SoDoS each! Yiming will be Australia's representative at the 4th Korean Prime Minister's Cup in Korea in October. Full results are in the Files section. The final event for the year is the most important, the National Championships in Melbourne. Please register so the organisers can plan for the number of participants! The ACT Open Championship was won by Guyu Liu, with 6 straight wins; Yiming Guo and David Ormerod came 2nd and 3rd. The Handicap section was won by Jordan Ceglinski. The tournament was run as a McMahon, so after the second round the kyu players were mixed in with the dan players; Jordan's record indicates we have to upgrade his ranking significantly! The AGA announces a new Problems Competition (see the link above) open to all, with book prizes generously donated by David Mitchell and John Hardy. The NSW Championships results (won by Guyu Liu), together with the latest Ratings and Representative Points, are in the Files section. Members of the AGA can see their own up-to-date Ratings and Rep Points on their member page. There is a report of the tournament in the Journal. The next event will be the ACT Championships 25-26 July, and then the one-day Korean Ambassador's Cup on August 8 in Sydney. The 13th NEC Cup was, as usual, a tremendous success. Kawamura-sensei brought 40 Japanese players with him for his farewell visit to Australia marking his retirement from professional play. See Photos from the weekend and full results. AGA events coming up in the next few months: Ballina Go Camp in May, NSW Championships in June, and ACT Championships in July. Winner of the Queensland Championships was Kevin Jiang; Amelia Gray won the kyu section. Read all about it in the Australian Go Journal - and bookmark the Journal while there! A long-weekend Go camp will be held at the beautiful northern NSW beach resort of Ballina, May 2-4. Organised by the Brisbane Go Club, professional Young Gil An 6p will be in attendance. Details here. And don't forget to register for the 13th NEC Cup, April 18-19, and note the new venue! The winner of the 31st Australian National Go Championships was Miao Zhao of Sydney. Miao edged out He Jianghong on SOS after both won 5/6 games. Division two was won by Erli Qiu of Brisbane with six straight wins. The tournament was held from 22-23rd November with a teaching day on Friday 21st. Professional players An Young Gil (6p) of Korea and Wu Shu Hao (3p) of China were present on all three days and provided excellent instruction to many players. Thanks to John Hardy and the Brisbane Go Club for organising a very enjoyable event. Raphael Shin represented Australia at the 29th World Amateur Championships in Tokyo, May 27-31. Raphael finished 19th out 68 players with 5 wins out of 8, defeating Ireland, Belarus, UK, Switzerland and NZ, losing to Serbia, Luxembourg and Romania (the latter two being well-known European players Laurent Heiser and "Cornel"). Some photos are on the Events page. Joanne Missingham won all her games at the Toyota-Denso Cup in Brisbane, January 18-19, and so will go on to the next round of the Oza qualifying tournament in Japan. The Australian Go Association regrets to inform the Go community here in Australia and world-wide of the death of Wu Song Sheng 9p, in Sydney on December 24. Mr Wu was born 1945 and was one of the strongest players in the pre-professional era in China and a teacher of many of the leading professional players since then. He was given a 9 dan rank as soon as China gave professional ranks (1982). He migrated to Australia in 1985 with his family, though later for a time resuming his Go career in South Korea and China. Mr Wu was Honorary National Coach of the Australian Go Association. Amelia Gray and John Hardy had a great time representing Australia in the International Amateur Pair Go competition in Tokyo. John's report is in the Files section (for now --- watch for an AGA Pair Go page. Yiming Guo represented Australia in the 2nd Prime Minister's Cup in Seoul, coming in 8th (places 3-9 all had 6 wins out of 9). Yiming, Raphael Shin and Dong Ming Liu then formed a team at the Hangzhou International Cities Cup tournament, which proved an even tougher competition. Amelia Gray and John Hardy, from the Brisbane Club, will represent Australia in the International Amateur Pair Go competition in Tokyo in November. David He is the 2007 Australian Champion, winning all 6 games at the National Championships in Sydney. Raphael Shin, at the top of the Credit Point table after the Nationals, becomes our representative at next year's World Amateur Championships. The winner of the Korean Ambassador's Cup in Sydney was Yiming Guo, who becomes our representative in the 2nd Korean Ambassador's Cup, Suwon City, Korea, in October. The battle for first place between Yiming and Miao Zhao depended on a very tight last game between Yiming and Sena Lee. In the end Yiming won the game and the Cup, he and Miao each with 5 wins and equal SoS but a difference of just 2 points in SoDoS (although Yiming defeated Miao in their head-to-head game so would have won even if their SoDos were equal). The Sydney Korean Baduk Association will host the Korean Ambassador's Cup on the weekend of August 4/5. This will be the qualifying tournament for selection of the Australian representative in the 2nd Korean Prime Minister's Cup, Suwon City, Korea to be held in October. Winner of the NSW Championships was Zhao Miao, newly arrived from China. Congratulations to the Sydney Club for their excellent new venue, which should see the club growing back to its former numbers. Winner of the NEC 1st Division on April 22 was 15-year old Yang Han. Recently arrived from China, there was a bit of a problem assigning him a rank (the NEC is a handicap tournament) but he said could play a bit, so he was tentatively given a rank of 7dan. Visiting Nihon Kiin pro 9dan Shinichi Aoki commented he is a good deal stronger than that! The Australian representative at the 28th World Amateur Go Championships to be held in May at the Nihon Ki-in in Tokyo will be Hae Taek Choi. 16-year old Jimmy Yuan from Christchurch will be playing for New Zealand.